A natural food protein. Enhances natural flavor, expands freshness and improves yield. If your bread hasn’t been rising as flourishing as you’d like, strengthen your mix with the L’Equip Vital Wheat Gluten. Grains like barley, wheat and rye typically contain water-soluble, highly elastic proteins called “glutenin,” or “gluten” for short (and “vital gluten” is another name for the same thing). As yeast produces carbon dioxide gas within promoting bread dough, gluten in the dough that traps the bubbles, giving your bread the delicate texture everyone loves. If the grain that you start out with doesn’t have plentiful quality or measure of this L’Equip Vital Wheat Gluten to begin with, you will get brick bread—and no one likes that type of bread at all! 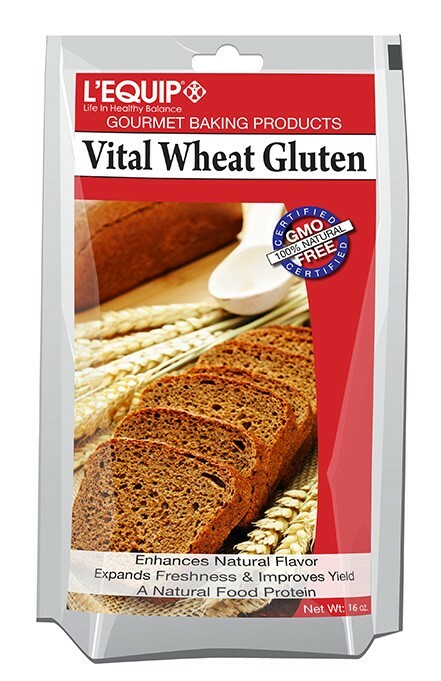 The proper amount to use is 1/4 to 3/4 cup of L’Equip Vital Wheat Gluten per 10-12 cups of whole grain flour. Each package/pouch has a convenient zip closure to keep the Vital Wheat Gluten fresh between uses. Be the first to review “L’EQUIP Vital Wheat Gluten (27 oz. )” Click here to cancel reply.